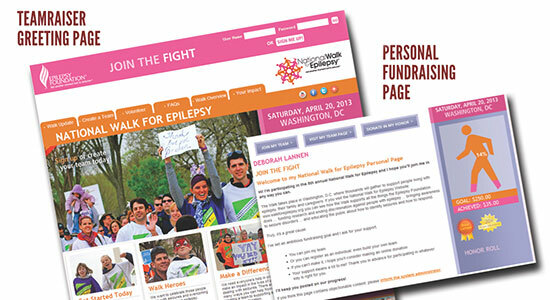 With the 2013 National Walk for Epilepsy fast approaching, the organization was looking for a fresh new design for their peer-to-peer event. This national walk is one of Epilepsy Foundation of America’s (EFA) biggest supporter campaigns of the year. They’d used a variant of the design in 2012 and had gotten feedback from their event participants that needed to be addressed in a refresh. Our combined teams (EFA and Firefly Partners) did not have a lot of time – the public kick-off date had been selected and event registration needed to launch on time. The team at EFA was most concerned with highlighting the four main actions around event participation and support. Firefly created a new event greeting page with effective pathways for visitors, supporters and participants. Fewer Duplicates — Firefly’s team created a user flow that made it super intuitive for a returning participant to log in and register without creating a duplicate record in the CRM system. Engagement Recognition — Participants who meet or exceed team and fundraising goals receive special badges. We set these up to automatically populate without using precious staff time to manage. Fully Branded Communication — Firefly added custom CSS so fonts, colors and other styles remain consistent throughout every action, page and email message.